Sword & Sorcery: the Immortal Souls core set. 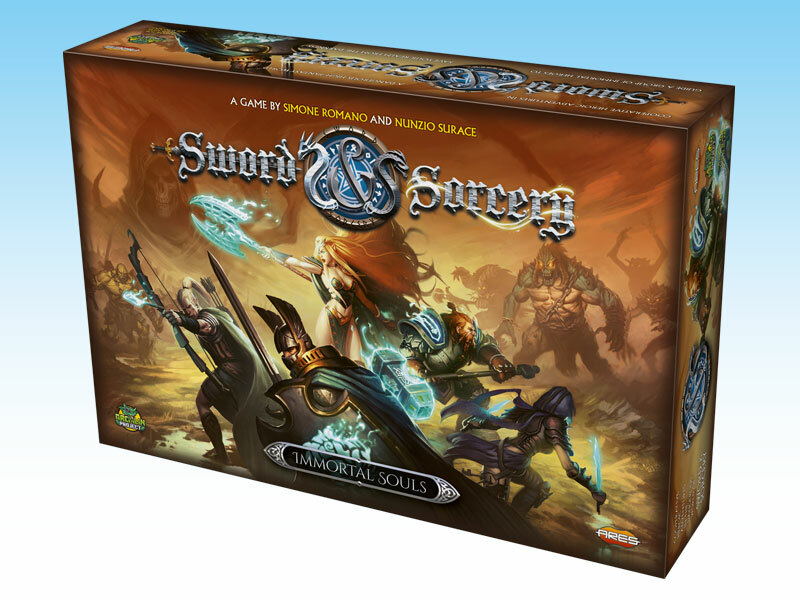 The long-awaited epic-fantasy cooperative board game Sword & Sorcery, funded on Kickstarter with over $500,000 pledged, is now arriving at retail after almost 5,000 copies were shipped to Kickstarter backers. The starter set Sword & Sorcery - Immortal Souls, and two accessories (Custom Dice and Doors & Chests) are in US stores now, and will be available in other countries in the coming weeks. In Sword & Sorcery game, up to five players control heroes with unique powers, fighting together against the forces of evil - controlled by the game system itself - to save the kingdom and break the spell that binds their souls. The heroes are legendary characters brought back to life by powerful sorcery. Weakened by the resurrection, they grow stronger during their story-driven quests. By acquiring soul points during battles, the heroes’ souls regenerate, restoring their legendary status with multiple powers, magic and soul weapons, and powerful artifacts. 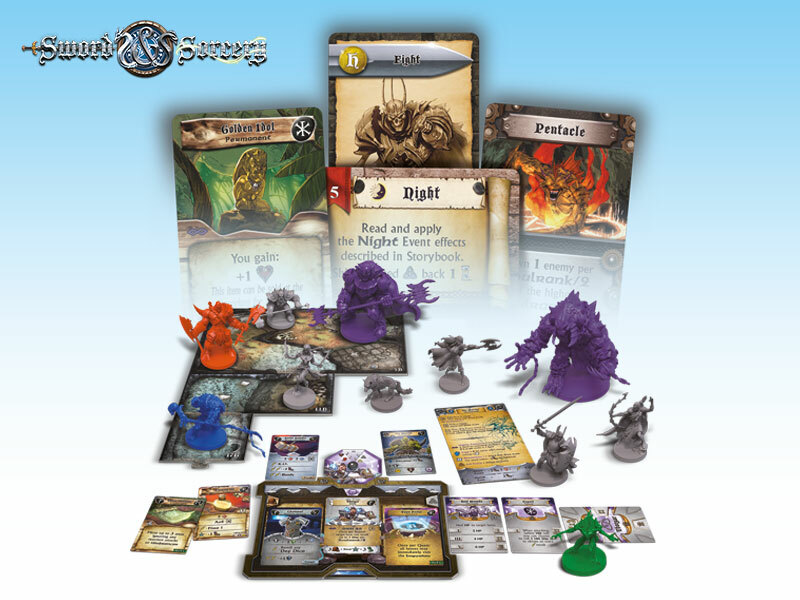 Immortal Souls: a view of the Starter Set's components. 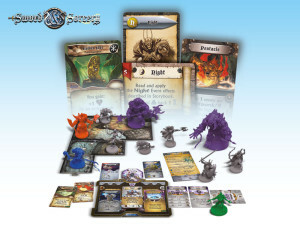 The core set, Sword & Sorcery – Immortal Souls, presents 28 ultra-detailed 32mm scale figures, 19 double-sided map tiles, several decks of cards, a Storybook and over 100 tokens and other components. It features Solo Play, high character customization, sophisticated combat and magic system, and quests designed to be completed in about 90 minutes or less. 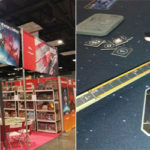 In addition to the starter set, two accessories are releasing now: the S&S Custom Dice Pack, which adds a extra set of dice to speed up the combat resolution, and the S&S Doors & Chests, which features 3D figures to upgrade the cardboard doors and chests included in the starter set. Sword & Sorcery will be soon expanded with new releases. In November, two Hero Packs are scheduled for release, introducing two new heroes (Samyria and Onamor) in the game. The second campaign, Arcane Portal, is scheduled for release in January, 2018.